The Italian State Mint (Instituto Poligrafico e Zecca Dello Stato) will issue in October a new collector coin in the EUROPA series, focusing on the subject of Italian art. This coin features the art and culture from Aquileia, an ancient Roman city in what is now Italy. 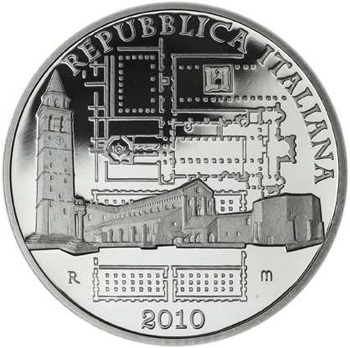 The obverse of the coin includes a blueprint of the restoration works carried out on the monumental complex of Aquileia, with a perspective view of the Basilica from the Piazza del Capitolo. The inscription “REPUBBLICA ITALIANA” (Italian Republic) appears above with the year of issue 2010 included below. 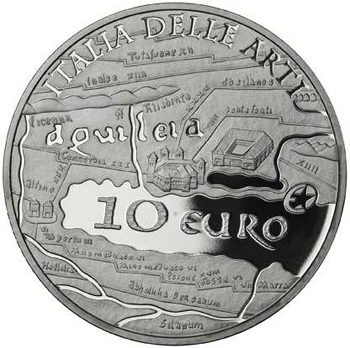 The reverse features a stylized map of the city along with the inscriptions “AQUIELIA” and “ITALIA DELLE ARTI” (Italian Art). The coin’s value “10 EURO” appears with the EUROPA logo or insignia to the left and above the value. The coin carries a nominal face value of €10 and is struck in .925 silver to proof quality. Each coin has a diameter of 34 mm and weight of 22 grams. A mintage limit of just 7,500 pieces has been set. For more information on this and other coins offered by the Italian State Mint, please visit their website at: http://www.ipzs.it/news/coins10/home.html which will take you directly to their calendar of issues for the remainder of 2010.